Organized as Weller county in 1855; name changed to Osage in 1859. Originally named for John B. Weller, of Ohio, member of Congress and Governor of that state; also Governor of California, and Senator, Minister to Mexico. The name Osage comes from the Osage River, the headwaters of which stream drain almost the entire county. Lyndon is the county seat. 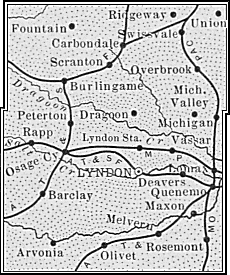 The Santa Fe Trail ran across northern Osage County, passing through Overbrook, Scranton, and Burlingame. OriginallyWilliam G. Cutler’s History of Kansas , first published in 1883, tells about early Osage County. The Special Collections of the Ablah Library at WSU contain historical images of Quenemo, Overbrook, Scranton, Osage City, Carbondale, Olivet and Burlingame. The Kansas State Historical Society has historical data for Osage County online including a rich bibliography and lists of cemeteries, post offices, and newspapers. Osage County News P.O. Box 62, Lyndon, KS 66451, 785-828-4994 phone/fax, email [email protected]. Read it online at www.osagecountyonline.com. Kansas County Profile Reports Statistical data from The Institute for Policy and Social Research, the University of Kansas. Photo by John and Susan Howell. Osage County Attorney 785-828-4931, Fax 785-828-3150, 717 Topeka Ave., P.O. Box 254, Lyndon, KS 66451, email [email protected]. Osage County Clerk 785-828-4812, Fax 785-828-4749, 717 Topeka Ave., P.O. Box 226, Lyndon, KS 66451, email [email protected] . 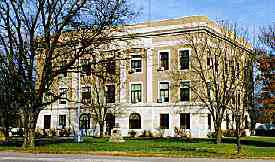 Osage County Appraiser 785-828-3124, Fax 785-828-3712, 717 Topeka Ave., First Floor, P.O. Box 292, Lyndon, KS 66451, email [email protected]. Osage County Economic Development 785-828-3242, Fax 785-828-3546, 131 W. 14th St., P.O. Box 262, Lyndon, KS 66451, email [email protected]. Osage County Emergency Management 785-828-3323, 131 W. 14th St., Lyndon, KS 66451-0423. Osage County Health Department 785-828-3117, 103 E. Ninth St., Lyndon, KS 66451. Osage County Jail 785-828-4991, 702 Ash St., Lyndon, KS 66451, email [email protected]. Land Development Office 785-828-3347, Fax 785-828-4749, 717 Topeka Ave., P.O. Box 221, Lyndon, KS 66451, email [email protected]. Register of Deeds 785-828-4523, Fax 785-828-3648, 717 Topeka Ave., P.O. Box 265, Lyndon, KS 66451. Osage County Road and Bridge Department 785-828-4416, Fax 785-828-3432, 128 W. 15th St., Lyndon, KS 66451, email [email protected]. Transfer Station, C&D Landfill 785-528-3790, 4045 W. 229th St., Osage City, KS 66523. Open 9 a.m. to 4 p.m., Monday-Saturday. Recycling Center 785-828-3824, 208 W. 17th St., Lyndon, KS 66451. Osage County Sheriff’s Office 785-828-3121, Fax 785-828-3662, 131 W. 14th St., Lyndon, KS 66451, email [email protected]. In case of emergency, dial 911. Osage County Treasurer 785-828-4923, Fax 785-828-3336, 717 Topeka Ave., Lyndon, KS 66451, email [email protected]. Noxious Weed Department 785-828-3280, 727 W. Sixth St., Lyndon, KS 66451. Frontier Extension District 785-828-4438, 128 W. 15th St., Lyndon, KS 66451-0400. Osage County Conservation District 785-828-3458, 115 W. 17th St., Lyndon, KS 66451. NRCS/Farm Service Agency 785-828-4631, 115 W. 17th St. Lyndon, KS 66451. Rapp School is a beautifully preserved one-room eight-grade school on U.S. Highway 56 west of Osage City. Superior School is located two miles south of Burlingame on U.S. Highway 56. Melvern State Bank building has served the Melvern Community for many years, 102 S. Main St., Melvern. Lyndon Carnegie Library is at 127 E. Sixth St., Lyndon. Railroad Park, Melvern, features a historical bridge that crosses the railroad tracks, along with a train overlook and viewing platform. Bailey House, in Lyndon, is an old log home that was moved to the Lyndon City Park to preserve its place in local history. Osage County is blessed with two federal lakes: Melvern Lake and Pomona Lake, and two state parks, Pomona State Park and Eisenhower State Park. Enjoy Osage County’s hospitality and explore our unique and interesting Places. A list and map of Osage County’s cemeteries is available here; information compiled by Osage County Historical Society and published by Osage County News. Osage County has many houses of worship, in which to share your faith, meet fellow worshipers and find your church home. See the Churches of Osage County to find churches in your community. Burlingame Post Office – 66413, 123 S. Topeka Ave., 785-654-3823 – Monday-Friday 7:30 a.m.-12 p.m.; 1-2:30 p.m.; Saturday 8 a.m.-9:30 a.m.
Carbondale Post Office – 66414, 223 Main St., 785-836-7682 – Monday-Friday 8:30-11:30 a.m., 12:30-4 p.m.; Saturday 8:30-10:30 a.m.
Lyndon Post Office – 66451, 712 Topeka Ave., 785-828-4441 – Monday-Friday 8:30-11:30 a.m., 1-4:30 p.m.; Saturday 10:30-11:30 a.m.
Melvern Post Office – 66510, 118 NE Emporia St., 785-549-3631 – Monday-Friday 8 a.m.-12 p.m.; Saturday 8-9 a.m.
Osage City Post Office – 66523, 123 S. Sixth St., 785-528-4431 – Monday-Friday 8 a.m.-12:45 p.m., 2 -4:30 p.m.; Saturday 8:30-10 a.m.
Overbrook Post Office – 66524, 320 Maple St., 785-665-7712 – Monday-Friday 8:30-11:30 a.m., 1:30-3:30 p.m.; Saturday 8:30-9:30 a.m.
Quenemo Post Office – 66528, 121 N. Fifth St., 785-759-3312 – Monday-Friday 8 a.m.-12 p.m.; Saturday 8:30-9:30 a.m.
Scranton Post Office – 66537, 324 S. Brownie Blvd., 785-793-2773 – Monday-Friday 7-11 a.m.; Saturday – 7-9:30 a.m.
Vassar Post Office – 66543, 130 Topeka St., 785-828-3362 – Monday-Friday 8 a.m.-12 p.m.
A list of Osage County post offices is also available here. Readers are invited to note needed updates, additions or corrections in the comment section. Why viewers still read newspapers when in this technological globe everything is presented on net? where do i find information for youth sports or parks and rec? See OCPR online at <a href="http://www.osagecity.com” target=”_blank”>www.osagecity.com – Click City Departments, then Parks & Recreation for program information, printable signup forms, schedules and more; or contact Corey Linton at 785-528-4610 or [email protected]. This is my first time to pay a visit at here and I am in fact impressed to read everything at a single place. This is a great page with a lot of helpful info!